Key here is word 'original', as the original versions of the Vladimir Tretchikoff The Chinese Girl framed prints just keep going up and up in price. 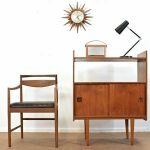 Once the staple of the house clearance store, these prints became 'hip' for anyone furnishing a midcentury-style room a few years back, which means the prices keep rising as the availability drops. Yes, there are copies and tributes on the market, but the originals are the ones you want. Not bad for something sold on the high street for very modest money in the '60s and '70s. This image actually dates back to the 1950s, but became high street fodder 10+ years later. These days, you'll be looking at eBay or vintage stores to get one. This example is in the 'original unglazed frame' and has 'excellent colour with no fading', with just 'some marks on frame with age but easily cleared up'. Price right now is £10.50.